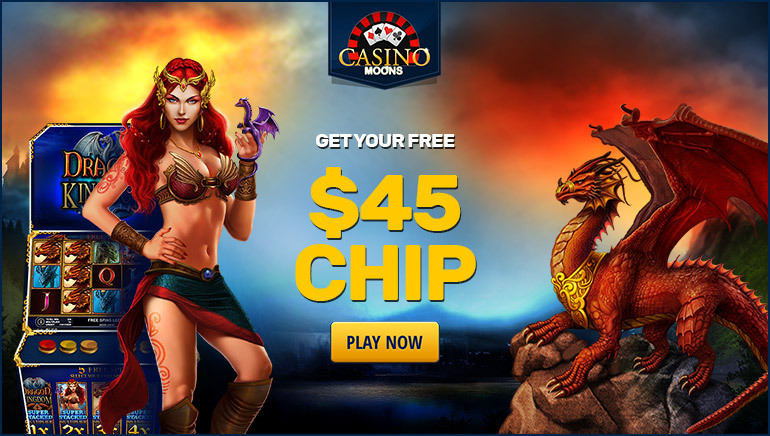 Take advantage of our exclusive offer and get started with $45 free play chip at Casino Moons - no deposit is required, just use our special code! If you're looking for some gambling entertainment but don't feel like risking any money, we have a great exclusive offer for Online Casino Reports we feel you're going to simply love. We've partnered up with Casino Moons to offer all new players a $45 free chip to try their luck with - no deposit required. It hardly gets better than that! Run it up With no Risk! There are no hidden tricks involved with this offer. All you need to do is sign up with Casino Moons using our link, use the special code OCR45FREE when signing up, and you'll get your $45 free chip. It's really as simple as that! You'll be free to use this money on more than 200 slots available at Casino Moons and this gives you enough of a bankroll to try your luck with a couple of games at least. If Lady Luck happens to be by your side, this can turn into a really nice starting bankroll. The maximum amount you can withdraw from the bonus is $100, but that's more than a decent sum considering you get to have fun and you aren't required to put absolutely anything on the line!